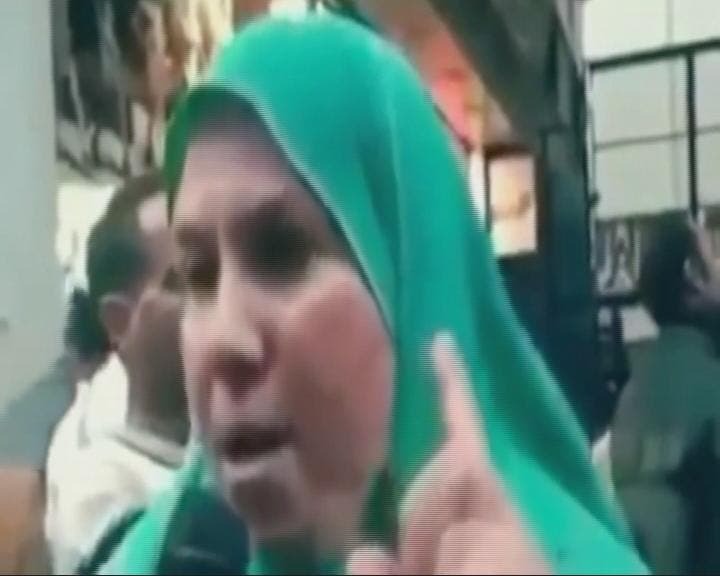 Little did that Egyptian woman know that her spontaneous rant against the U.S. president would be repeated by so many, and that her words would be rejigged into a techno remix that would go viral within days. This certainly was the Middle East’s “Joe the Plumber” moment; this Egyptian woman is now to the Arab world what Joe Wurzelbacher was to the U.S. back in 2008. 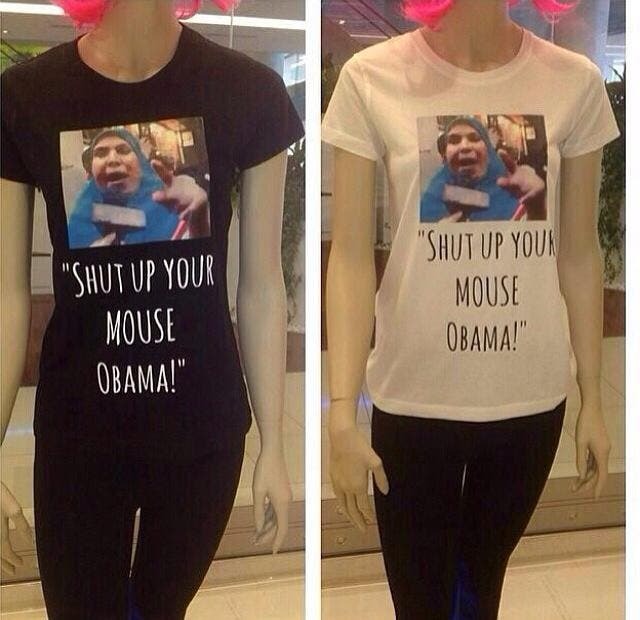 In fact, the woman’s rant was so popular that “Shut up your mouse” t-shirts are now being sold in Egypt. It is surreal to see how only a few words by the humblest of people can sometimes expose the biggest of governments or the most articulate of politicians. On this occasion, this simple woman managed to expose how U.S. foreign policy is perceived in the region: laughable! Less than five years since he mesmerized the Arab world with his historic Cairo speech, it is truly sad to see the popularity of this particular U.S. president plummet, not just among Egyptians, but across the region and in other long-time allies, such as Saudi Arabia, as well. 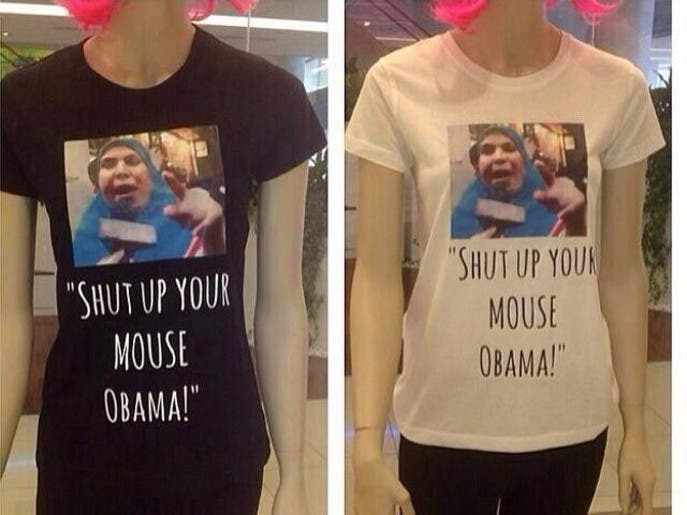 If I were to comment today, while President Obama is about to embark on a visit to Saudi Arabia, I would definitely refer to the now famous “Shut up your mouse” video as it says a lot. Perhaps the first thing it signifies is that people are growing impatient with mere words, Mr. President! For instance, why bother with issuing ultimatums to mass-murderers like Bashar al-Assad and pretend that there are red lines that he is not allowed to cross, if you are not going to abide by them or follow through with action? As conveyed by the woman in the video, Egyptians were angered by Obama’s appeasement of the Muslim Brotherhood following Mursi’s overthrow in particular. By saying “Sisi yes, Mursi no,” the woman not only touched on the U.S. being perceived as a backer of Egypt’s Muslim Brotherhood, but also as being against the country’s military strongman, Field Marshal Abdel Fattah al-Sisi. Though Sisi is yet to confirm his presidential bid, it is understandable that the U.S. might have concerns about yet another military power-grab in Egypt. This is entirely conceivable; in fact, there are other rulers and governments, which are much closer to Egypt, that have expressed the desire for the field marshal to stay in the military and serve as a guardian and protector of new-born democracy, rather than become the president. But the problem lies in the Egyptian perception of the White House as being pro-Muslim Brotherhood; a group that has now been placed on the terrorism blacklists of many of the U.S.’s own allies in the region. Then we were met with issue of the U.S. halting aid to Egypt following the revolution (or coup, whichever way you prefer to label it) which ousted the Brotherhood-backed Mursi. For his part, Mr. Obama - who in his 2009 Cairo Speech condemned how colonialism denied rights and opportunities to Muslims - must understand the consequences of cutting off aid, be it economic or military, at such a delicate time for Egypt. The consequences for the U.S. went far beyond merely a bad reputation or a negative image; it actually deprived Washington of one of its strongest political cards when neighboring GCC countries rushed in with financial assistance to bridge the gap caused by the American cutoff. Such actions are not only creating a rift between the White House and Egypt’s key politicians and military leaders (who are now reaching out to other global powers, such as Russia), but more dangerously, are also alienating the people on the street who - only three years ago - were thankful for Washington’s support of their revolution against the Mubarak regime. 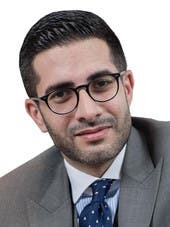 Faisal J. Abbas is the Editor-in-Chief of Al Arabiya English, he is a renowned blogger and an award-winning journalist who is working on an upcoming book on Arab Media. Faisal covered the Middle East extensively working for Future Television of Lebanon and both Al-Hayat and Asharq Al-Awsat pan-Arab dailies. He blogs for The Huffington Post since 2008, a recipient of many media awards and a member of the British Society of Authors, National Union of Journalists, the John Adams Society as well as an associate member of the Cambridge Union Society. He can be reached on @FaisalJAbbas on Twitter.